Hello our names are Sean & Marcela Lomas and we are proud parents of our son, Jayden, who had a stroke at birth. The cause for the stroke is almost always unknown or undetectable while the child is being born. Because of the stroke, Jayden suffers from a form of cerebral palsy called hemiplegia. What is hemiplegia? Hemiplegia is a neurological condition that weakens one side of the body, and affects up to 1 child in 2800. Jayden has fought an uphill battle after going undiagnosed by over 15 doctors and specialists in the first 8 months of his life. We had to go from doctor to doctor, city to city, hotels, etc. The financial aspect was a huge burden but we would do anything to help Jayden and get answers. We had to choose for Marcela to stop working her full time job so we had full attention on Jayden’s needs. He was finally diagnosed by MUSC specialists in Charleston, SC after an MRI showing he had a stroke in utero on the left side of his brain, essentially affecting the right side of his body. We were told Jayden may never walk, his right foot may always hinder him, he may never use his right hand, his speech may suffer extremely and so on. But Jayden is a warrior. Through his determination and courage Jayden is walking, he runs with a little limp, he's gaining more confidence in using his right hand and much more. His occupational, physical and speech therapists at McLeod Seacoast have done an incredible job. He attended pre-k for almost two years from winter 2013 to summer 2015. He did wonderful at the Carolina Forest Elementary Child Developement Class. This past August 2015 Jayden started Kindergarten at St Andrew Catholic School in Myrtle Beach with his brother Tyler who is in 3rd grade. He has continued to go above and beyond the unknown. His teachers have been unbelievable and JJ as usual is a superstar at school Jayden is a truly happy child who brings a smile to anyone’s face and he’s a true miracle. He has a tough road ahead but Jayden doesn’t accept the fact he’s any different. There are thousands and thousands of children throughout the world who go undiagnosed, without therapy, without answers, without hope. Many do not have the finances to even travel to a doctor let alone pay for one. Our family has formed many new “hemi-family” relationships. Our son Jayden is obsessed with sports but most importantly Baseball. Since his stroke affected his right side he fires that ball like a big league southpaw. He literally sits and watches baseball every day! He played his first organized recreation league coach pitch baseball in 2014 as a 4 year old with 5 & 6 year olds. 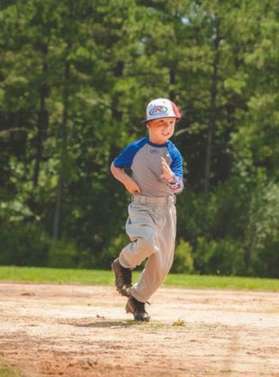 Baseball, America’s Pastime, has become my sons biggest outlet to rid him of the unfortunate situation he was put in. He has continued to excel from 2015-2017 in his Coach Pitch League in Myrtle Beach and then he started kid pitch travel baseball in the summer of 2017. MLB and NCAA have always done such big things for great causes such as breast cancer amongst other things and we are incorporating them in our plight to spread awareness. Major universities like Univ of South Carolina, Wake Forest, University of Maryland, Kansas, Duke, Henderson State and more wore I Am Jayden wristbands in 2013 & 2014 to spread the awareness. The Texas Rangers Single A Minor League Affiliate, Myrtle Beach Pelicans, will did the same on May 11th, 2013. The month of May represents Pediatric Stroke Awareness Month. Purple is the color signifying this. 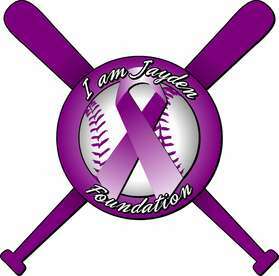 We have started the I Am Jayden Foundation to raise funds to give scholarships to pediatric stroke survivors, help with therapies and more! These children are the future as much as any child that hasn’t had to face this. They go to school, make friends, get married, have families and more. But if the awareness isn’t spread and the resources aren’t there, thousands of children go through life undiagnosed without therapy available, without medicines or braces or anything that may help them to live a more normal life. We have that power to spread this word. Please take into consideration what this could do. I’m asking to please make May the month to spread the awareness, wear purple wristbands, maybe use purple bats, wear a purple jersey, have a purple ribbon on your shirt amongst other things. We would have went through life being oblivious to what a Pediatric Stroke was but it hit home and we have faced it head on and want to spread awareness. Jayden has accomplished so much and yet we all know there is lots of work to be done. Every May there’s a day that Congress designates as Pediatric Stroke Awareness Day after my wife wrote a letter to Governor Haley. We’ll do what it takes to spread awareness towards the I Am Jayden Foundation. I Believe In A Pediatric Stroke Survivor!